The West Midlands Celebrating Construction Awards were held at the ICC Birmingham on Friday 13th April 2018, rewarding the very best in the Midlands’ built environment. Over 500 construction professionals gathered at the prestigious award ceremony to learn the shortlisted and ultimately the 2018 winners. 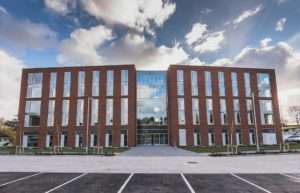 Newman University has recently taken hand over of their brand new Halls of Residence, comprising of 108 ensuite rooms, this high specification building will be home to a new set of students in the coming months. This building as constructed by Morgan Sindall is the latest project completion forming part of the University’s £15m Estates Master Plan, which started in 2015 and is due to finish in 2020, the University are delighted to have the Halls of Residence handed over Snag free. Fellows are proud of the long standing relationship with the University having now delivered £32m worth of Capital Projects. The next project is currently progressing and will provide further new facilities for the 2018/19 academic year.